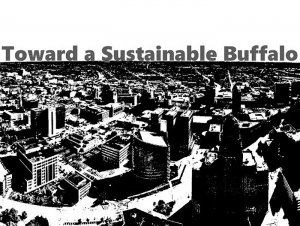 The Toward a Sustainable Buffalo Lecture Series is a collaborative effort by the Open Buffalo, Buffalo State’s Graduate School and the Center for Health and Social Research. This two-session series will feature distinguished community leaders, politicians, and other experts who will provide information about taking action on economic, environmental, and climate sustainability issues effecting Buffalo. The series will offer an interdisciplinary forum for discussing and addressing these issues. Buffalo State’s own Andrew Delmonte, business advisor and coordinator of the Social Enterprise Center, and Steve Peraza, policy analyst for Partnership for the Public Good and lecturer in the History and Social Studies Education department, will partake in the panel, Economic Justice: A Community Agenda to Advance Equity for All, on Monday, November 7, from 6:00 to 8:00 p.m. in E. H. Butler Library 210. Two more panelists, Ulla Bak, cofounder and president of Bak USA, and John Washington, campaigns and strategy manager at PUSH Buffalo will join them. Environmental and Climate Justice: A Community Agenda to Advance Equity for All will take place on Monday, December 5, from 6:00 to 8:00 p.m. in E. H. Butler Library 210 and will feature Eric Walker, director of energy development and management in the Erie County Department of Public Works; Harper Bishop, economic and climate justice coordinator at Open Buffalo; Brittny Baxter, upstate legislative organizer at New York Working Families​; and Ulysees Wingo, Masten District council member, Buffalo Common Council. These events are open to the public. Online registration is not required but is strongly encouraged; refreshments will be provided.